Nami was really happy to receive your birthday wishes and she is dealing with quite a bit of email from readers on her previous post so I’m here to rescue. By the way, I’m Nami’s husband Shen and I occasionally write restaurant reviews on Just One Cookbook. It’s been a while since last time I wrote a review on Din Tai Fung in Los Angels. I’m very excited about this month’s review and want to share the wonderful experience we had at Stella Mare’s Restaurant in Sana Barbara. Earlier this year during the summer, we took a trip with close friends of ours down to Oxnard, an hour and a half away from Santa Barbara. We stayed at the Embassy Suite which was perfect for a family vacation. The hotel itself is located right on the beach and there are plenty of family activities to do in the area for both adults and children. Nearby the hotel there is a great park with pirate ships and make-believe canons. The few days down there was a complete eat feast as we tackled the Chowhound recommended restaurants including HC Seafood. On our way back to San Francisco, we stopped by Santa Barbara for lunch and based on follow Chowhound’s recommendation, we decided on Stella Mare’s. With its quaint exterior and exterior, Stella Mare’s looks as if belongs more on a country road in Europe than in Santa Barbara. The actual building itself was built in 1872 and moved to the current location in 1962. The front of the restaurant had beautiful planter boxes with flowers in full bloom and the door was painted a very welcoming red. The interior of the restaurant was divided into a few large rooms and a couple private dining rooms. 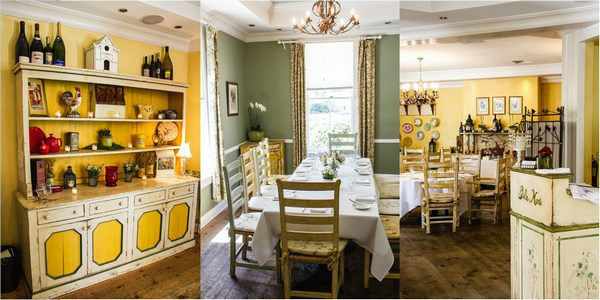 We had 5 children with us and were luckily accommodated in one of the private dining rooms. Before I start reviewing the food, I want to mention the service we received was just amazing. I was really impressed with the amount of attention the workers paid to the patrons and we felt extremely welcome, even with many noisy children. Sitting in the rustic dining room and looking out the sunny window, the ambiance was very relaxing and a perfect end to our vacation. Since we had a large party we got to tried many dishes that day. 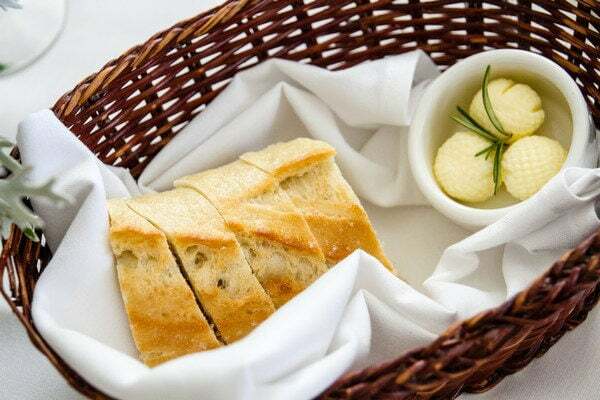 The restaurant’s bread service was paired with rosemary butter and it was delicious. I think the children must have easily gone through at least 6 or 7 baskets of bread. Other starters we had included the chopped salad, French onion soup, endive and apple salad, and escargot. The chopped salad was very refreshing with a hint of horseradish. 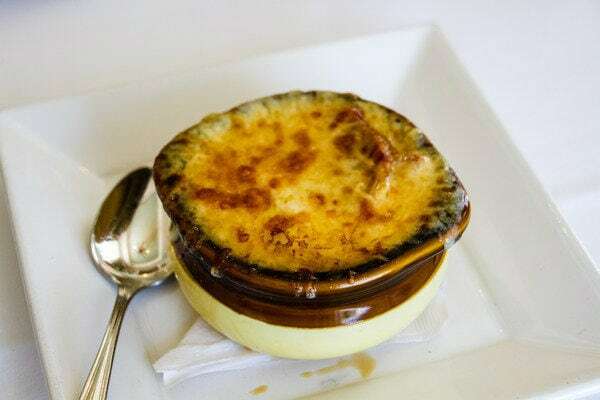 The French onion soup was very flavorful with soft cooked onion that practically melted in your mouth. The soup stock was not too heavy and it was covered with plenty of cheese (just the way I love them). 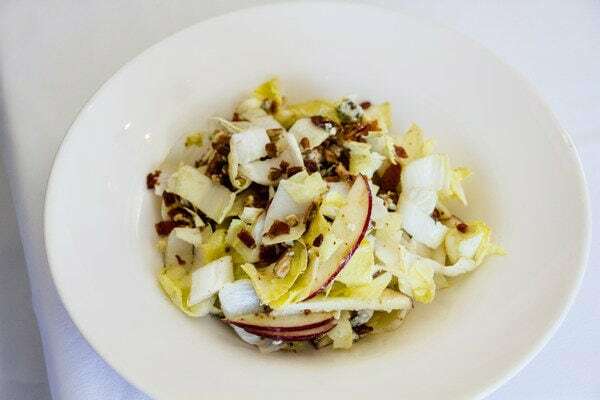 Besides the chopped salad we also had the endive and apple salad and it was very good. The only slight disappointment was the escargot. I love really strong garlic sauce and this one was a bit blend. 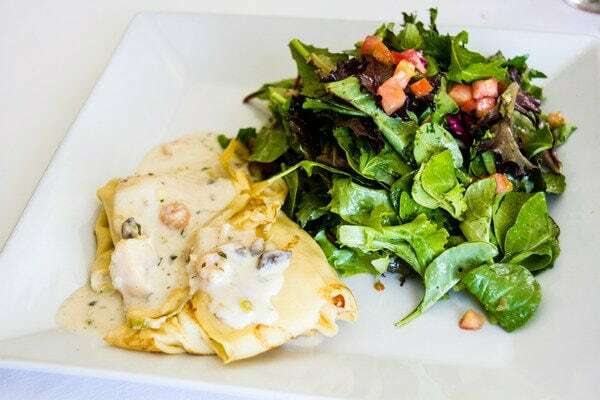 For entrée we had crab melt, the crepe, coq au vin, salmon, and the chicken salad. Everything was delightful and very satisfying to palate. 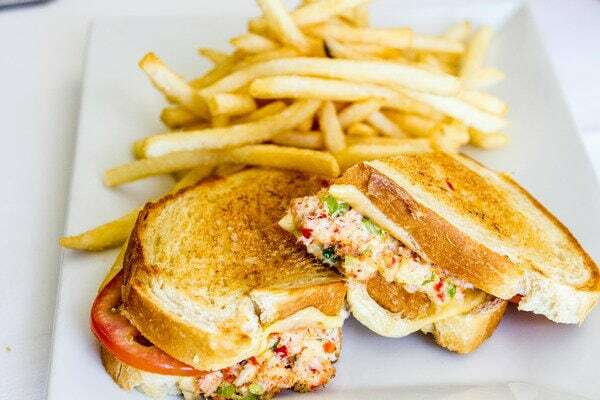 The mayo in the crab melt didn’t overpower the sandwich and you could taste the real crab in the crab melt. The crab melt had a kick of bell pepper in the flavor making it very interesting. The crepe texture was very refined and smooth and paired very well with the mixed green on the side. 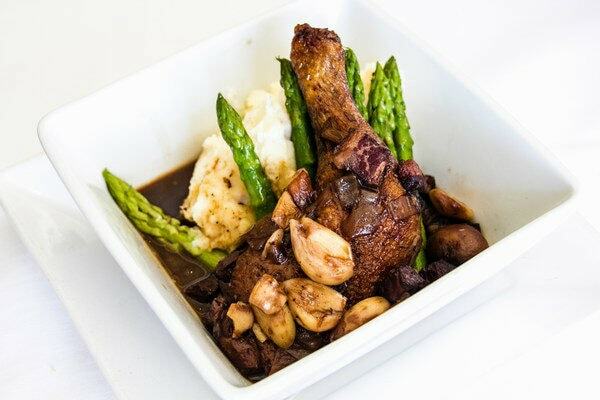 The coq au vin was very tender and each bite brings a bit of warmth to your heart. The salmon skin was crispy was advertised and the meat was done just right and not dried and overcooked. Lastly the chicken salad tasted if it was made with Japanese mayo (which we love) and tartness of the honey mustard vinaigrette finished the dish perfectly. It was a fantastic ending to our very fun trip, being able to enjoy a splendid meal with our buddies in such a beautiful setting. 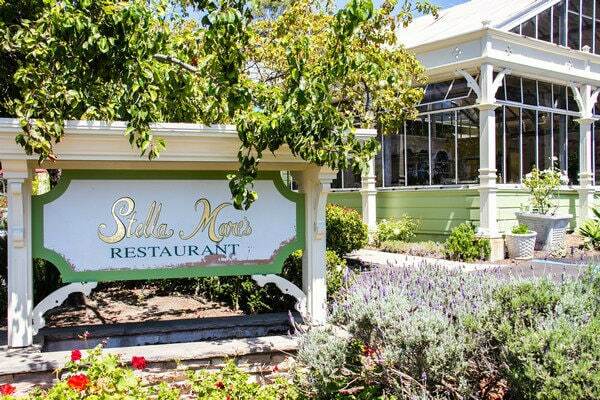 If you are visiting Santa Barbara, we high recommend Stella Mare’s Restaurant for great food and a relaxing time. Happy belated birthday Nami, I didn’t know until now. Interesting to see French onion soup with soft cooked onion. The nice thing about going to a restaurant with a large party is the prospect of sampling more dishes, which you definitely did. Great review, Shen! Please wish Nami well for me. Gorgeous photos! The French Onion soup looks lovely. Happy Birthday, Nami ~ I’m sorry I must have missed greeting you with the storm Sandy hitting us here in the east coast, losing power and all. Hope you had a nice birthday celebration with your family. May you be blessed with many more wonderful birthdays! 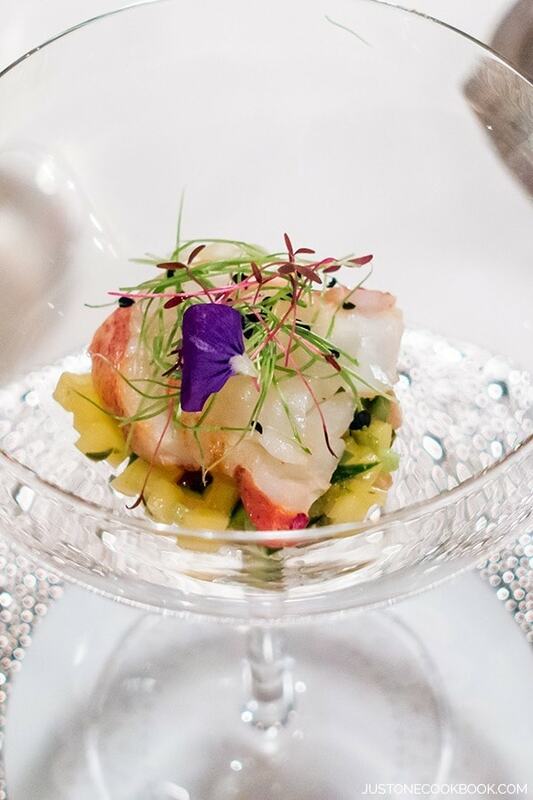 Thanks for this nice restaurant review & gorgeous photos, Nami’s husband! I would love to go to this restaurant if I’m ever in the Santa Barbara area — must bookmark this. Happy weekend to all of you! This place looks great! I love quaint atmospheres like this one :). My husband & I will have to check it out the next time we’re in Santa Barbara! Hmm, submitted a comment and I’m not sure if it went through. So if this is a duplicate, please remove! Anyway, super review. Santa Barbara is such a nice place to visit, and the restaurant looks great. I love their food presentation – the coq au vin in particular had such nice plating. Excellent job with the review – thank you. Coq au vin sounds good. 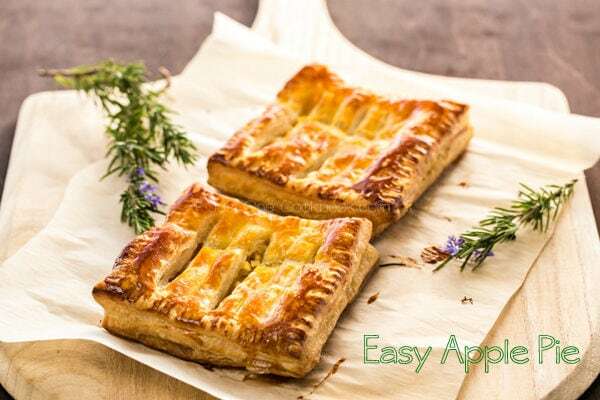 I have a few good recipes of that-After looking at the photo, I want to have it. It seems like a really nice restaurant. Another excellent review Shen, make me miss Sunny California again! Shen, I always look forward to your reviews!! Santa Barbara is a beautiful place, isn’t it? I’ve not eaten at this restaurant, but it’s not on my “to visit” list on our next trip. I’m loving that endive apple salad! I love Santa Barbara – very relaxing and lovely. What a nice pick for getaway and those pictures…lovely! Lots of yummy looking food. Thank you for stepping in and doing the post. I hope this comment shows up as the new site hasn’t been working for me. Thank you, Shen for a lovely and appetizing description of this charming restaurant: cosy and welcoming! I love restaurants with a multiplicity of rooms leading to a homelike atmosphere obvious in the photos here. No one does crab melts. Im going just for that. 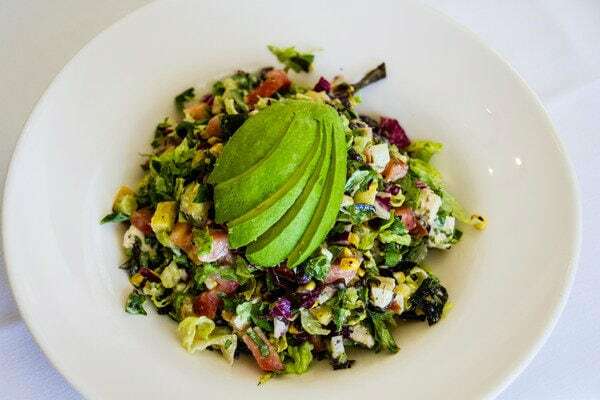 Love that whole sliced avocado on the chopped salad! Everything look so yummy, especially the chopped salad , give me an idea to prepare this way next time. Great review! And HAPPY BIRTHDAY NAMI!!!!!!!!!!!!!!!!!!! The restaurant sounds like a paradise on earth! I would love to taste every single dish and I would certainly devour coq au vin. 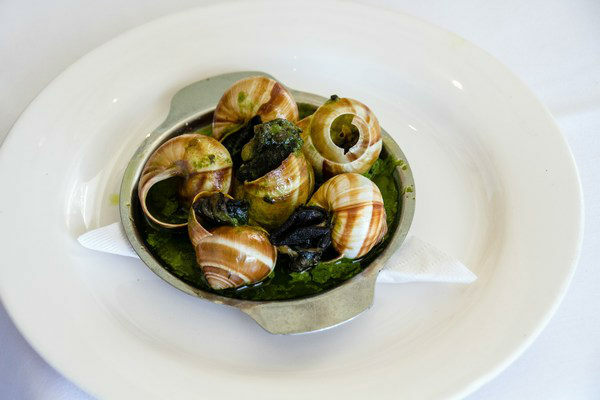 I am a big fan of snails so I imagine how disappointed you were if the garlic and herb butter wasn’t garlicky… (I always order snails as a starter in French traditional restaurants, unless I have foie gras 😉 ). I don’t know how you have managed to take such professional photos in a restaurant. You are really the best! I think they should use the first photo as an advertisement. It’s perfect. I’ve never found a miss on Chowhound yet! What an awesome meal and a great environment! 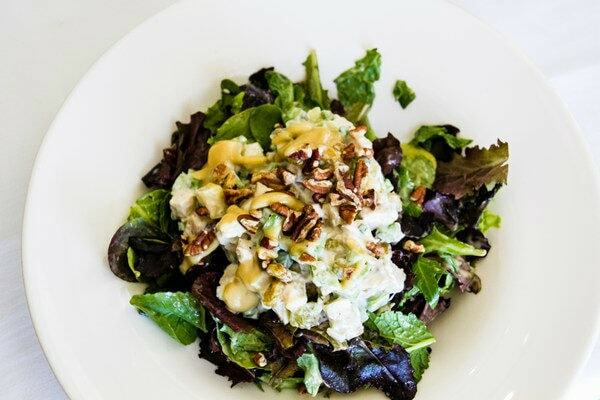 Everything looks fabulous from the salad to the entrees! And how on earth did you manage to get such great pictures! all look fantastic nd delicious! Thanks Shen I love the pics!! Hi, Shen, Nami’s husband…What a wonderful-looking place this is! I love places with character like this one. 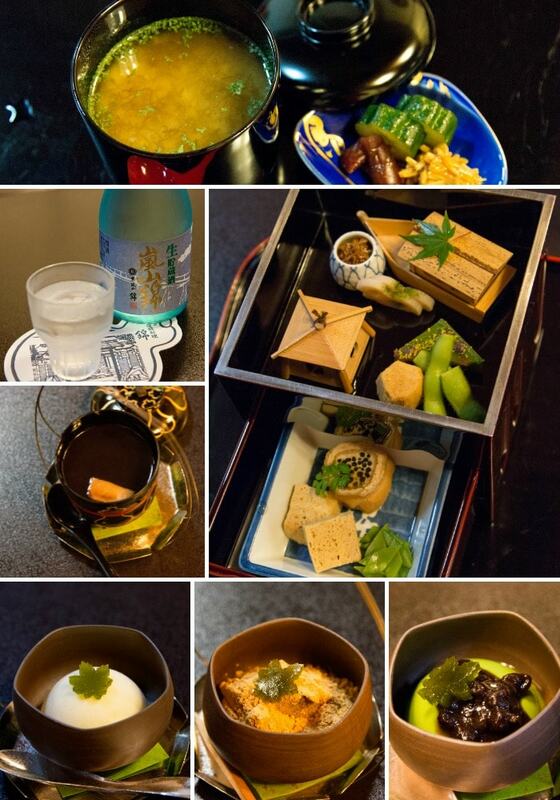 I’m sure the food was just as good, judging from the positive reviews and the wonderful photos! Did the restaurant owners actually intend to name it Stella Maris–Star of the Sea? Just curious. What a gorgeous place! 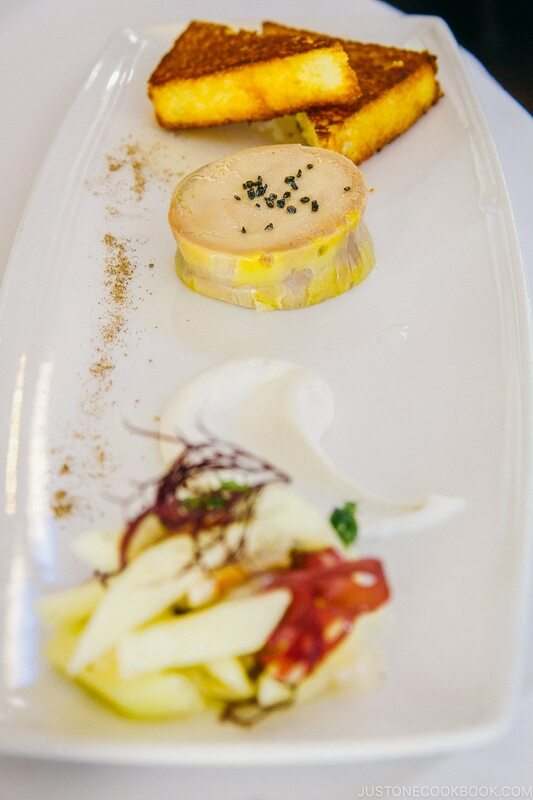 It looks divine and the food looks really good too (although like you, I like a strong garlic sauce with escargot :)). It looks like the recommendation for lunch at Stella Mares was a good one. Oh, and belated Happy Birthday wishes, Nami. Hi Shen, delicious review. I particularly love the look of the French onion soup, and the chopped salad. The last time I was in Santa Barbara, my meal was… ice cream! Next time, I will book a table at Stella Mare. Looks like a great spot to dine…in fact, everything looks delicious!!! Thanks for sharing, Shen! Shame about the snails but sounds like a good place! Bravo, Shen! 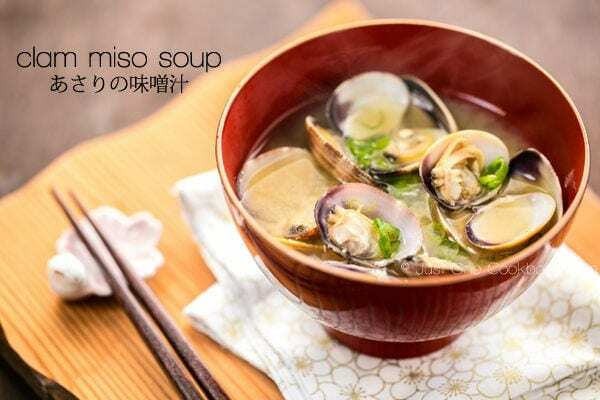 Photos of dishes look very tempting, and that much more appealing and delicious! Beautiful restaurant and over all fantastic review as always! I love the decor of that place, would love to be there -)) Happy Birthday to you , dear Nami! May all your dreams & wishes come true! Hello Shen! 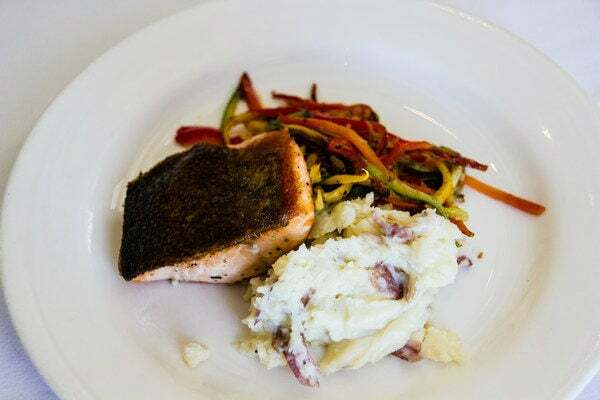 I hope Nami had a wonderful Halloween/Birthday 🙂 Our youngest son plans to apply to UC Santa Barbara so I took notice when I saw your review. This restaurant really does look so quaint. I just love the look of it. What a delicious menu. You guys really made some good choices. We will be looking for places to go out to eat when we visit him so maybe one of these days we will be able to visit. Hello Shen, wonderful review of a terrific restaurant – the pictures are great but (apart from the food), I really like the picture of the yellow and white cupboard! And I like the fact that you mentioned that the staff was nice, particularly with all the kids! Have a good week! Looking forward to your next review! I am salivating as I scroll down each photo, very nicely shots! and great review! Shen, so lovely to “meet” you. Through Nami’s posts we all feel like you’re a part of the family. Wonderful review – honest and fair. What an awesome review! That crab melt is seriously killing me right now! I totally need to somehow recreate that! Looks like a great place to stop in Santa Barbara. 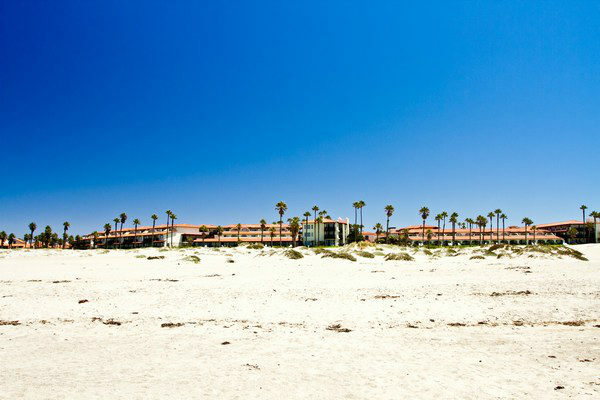 I used to live in San Luis Obispo and remember how many wonderful beaches and places to eat from Santa Barbara on up. I’m so excited to see this review on your blog! I took my mom there back in 2010 before she moved to Vegas. We had a perfectly lovely lunch. Thanks for the memories. P.S. 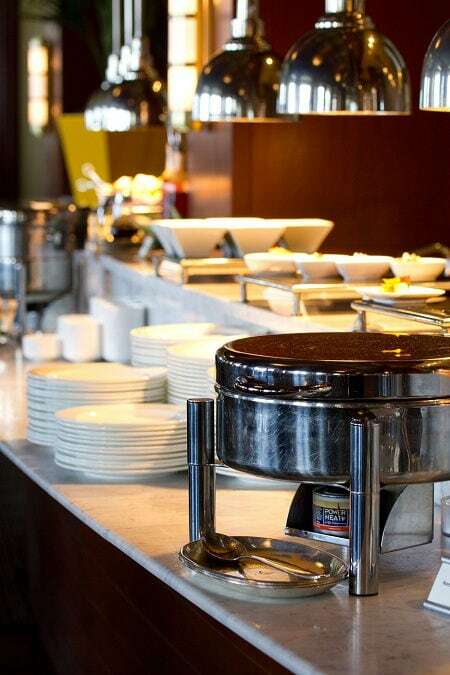 Your photos are terrific, really convey the feel of the food and the place. Hi LL! Now I am happy that you had the review! It was my pre-blogging days that I didn’t know your post about this restaurant. I enjoyed your review. As always take the best pictures at restaurant! Thanks for the link!